Trico is going to eat me! A few minutes with The Last Guardian VR Demo. I have not played The Last Guardian. I have, however, been reduced to tears laughing at YouTube videos of people cursing at Trico, the titular giant dog-thing, attempting to get the creature to comply with the simplest commands. That was good enough for me. I decided that I don't need any more frustration in my life, and so I passed on playing the game. However, when Sony threw The Last Guardian VR Demo into their store yesterday for free, I was intrigued enough to download it and give it a shot. I'm not sure what this demo is for - either a VR demo for the standard game, or a demo for a VR version of the game (less likely) - but I can say that this very brief experience has convinced me to take another look at The Last Guardian. The demo is seriously only 5-10 minutes long. There isn't much to do beyond teleporting around, tossing some barrels for Trico to eat, and solving a couple of puzzles so easy that I hesitate to even call them "puzzles". However, as short and simple as this demo is, it is one of the most convincing VR experiences I've had. There were at least two moments when I actually gasped and said "Oh my God" out loud. 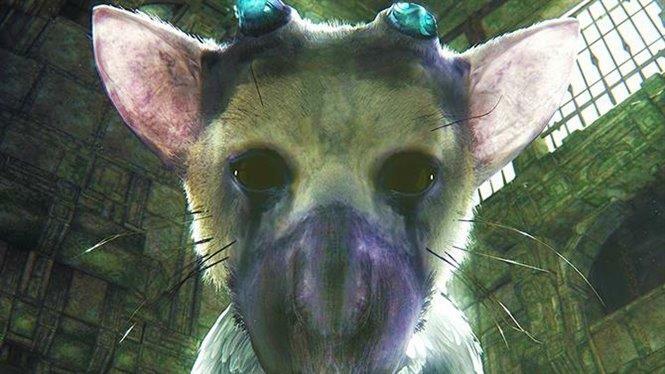 When Trico first appeared and brought his giant head down for an up close look at me, I thought for sure this thing was going to eat me, and I physically took a few steps backwards. And before long, I found myself talking to Trico. I had no expectation that it would answer or respond, of course, but nonetheless this thing was so convincing that I talked to it. The environments are nicely rendered as well. The demo takes place in what appears to be the ruins of an old castle or fort, and there is a great sense of scale and height. At one point, Trico jumps across a wide space, and I stood for at least a minute and watched pieces of wood that had broken free from where he landed, floating down to the ground below. Each piece of wood followed its own path, some falling straight down, some fluttering in the wind in accordance to their shape. That is attention to detail, folks. I dug The Last Guardian VR demo. If this game were ported to VR (or better still, if a VR experience were created from the ground up using the same assets and setting), I would absolutely play it. I know that a lot of people complain that some of these smaller VR experiences are little more than "tech demos", but when tech demos are as good as this one, they can keep them coming.